When you need advanced data processing and multimedia performance from your PC-based ATM platform, Tidel has you covered. The 3800 provides all the necessary horsepower and features to run today’s demanding transaction, security and advertising related applications on a surprisingly cost-effective platform. The 3800's system software is based on the Windows XP operating system, which allows for processor intensive applications to be developed rapidly on a universally recognized software architecture which is WOSA compliant. The high-resolution display allows for brilliant full-screen and full-motion MPEG-2 advertising or entertainment videos to engage your customers. Hardware expansion through the optional Sidecar Module allows for technologies such as bill validators, security cameras, bio-metrics hardware and full-bed scanners which are used in revenue generating applications such as check cashing, bill payment, prepaid cards and money orders. 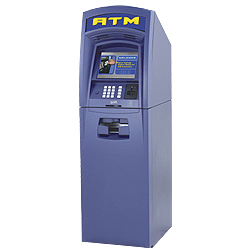 The 3800 provides the ultimate solution for those who need to maximize the speed and functionality of their ATM platform.